This was my attempt at wearing something casual on purpose to work. I'm not really sure why that was my intention, but this is what I wound up in. It still involved a minimally heeled shoe so I don't know how casual it really is. I tried. I picked this vest up in Vegas at the Nordstrom at Fashion Show Mall. From about 10 steps away I was convinced it was real leather. It's not, which makes it even better for summer. I envision wearing it over a maxi in the coming weeks. 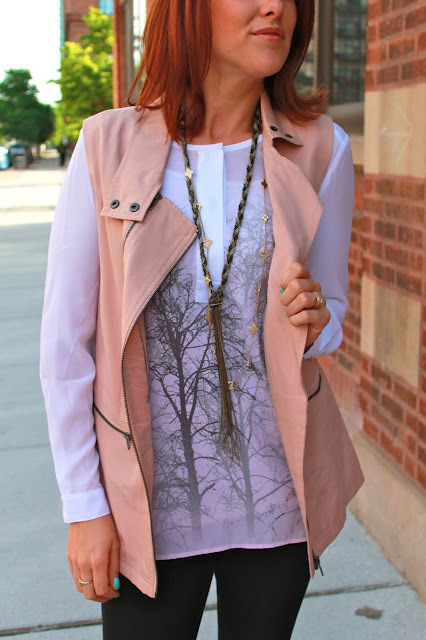 Gold necklace: Lia Sophia "Jacqueline"
I love bare trees and I love that tree blouse! !